I've always been a big fan of lip product, don't you know that lovelies? LOL. I have a lot of lip products and I always ended up buying lip products in every shopping therapy that I've done. 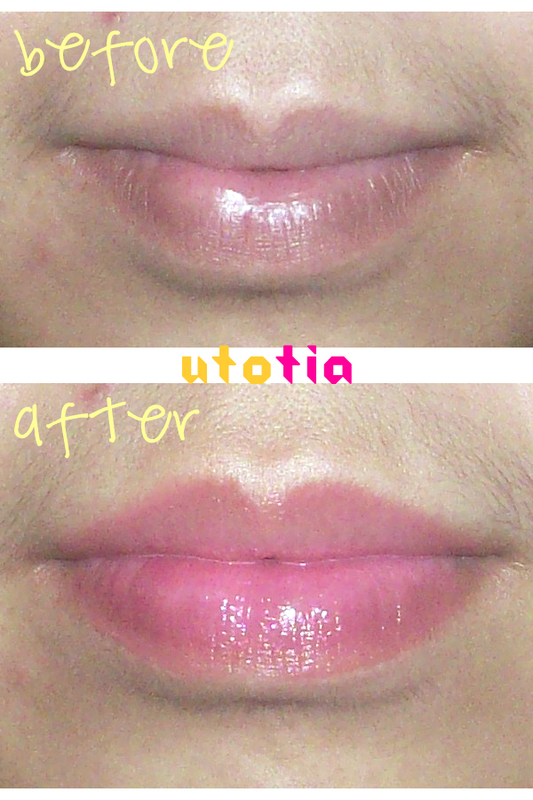 So here it is, another review about another lip product! This time it's a lip tint from Etude House, NEW Fresh Cherry Tint in OR201. I bought this around 3 months ago, along with my friends. I fall hard for lip stains since it gives me natural finish and suitable for all occassion. Can't afford Benetint though, it's too pricey for me. So, the Korean brands are heaven for me, since mostly they provide from head-to-toe products and still affordable for a student like me. It comes in a cute packaging, actually this product has word "NEW" on it because this is the upgrade version of the previous Fresh Cherry Tint. The previous one has an ordinary packaging, a tube packaging also with applicator inside. I gotta say that I love the new one, because the packaging now has slight curve, adding the cuteness to it. I also love the applicator because it's in cupid-bow shape, make it easier to apply the product onto the lips. But the packaging is a little bit bulky for me, because though it's smaller compare to other lip tint (Tony Moly Tony Tint and Etude House Dear Darling Tint), it's 'fatter' and sometimes will use up the space on my make up pouch. The texture of the product is liquid. It's so lightweight to the lips, unlike gel-type tint which tend to feels heavy at first. Moreover, I also love the scent and taste. Unlike Tony Moly's Tony Tint, this lip tint tastes good, it's sweet (but please don't eat it. I just accidentally taste it :p). The scent is also nice, it's a very nice and soft scent, judging from the name, then I guess it's cherry scent. The color is so soft that when I tried to do the swatch on hand, it is barely seen. I thought that this will look peach on my lips, but the color on hand and lips look very different. As you can see on the picture above, the color is peach on my hand. But, on my lips? It looks pink. See the picture below for comparison between my bare lips and after using Fresh Cherry Tint. Whoa, it is far from peach I guess. Haha, that's why I always look for Lip Product Review with swatch on the LIPS, not only on the HAND. Why? Well, you know by looking at the pictures above, right? The color between lips and your hand is very, very different. And so will the color of the lip products you apply to them. Anyway, it's a relieve that I just love the pink color as the result. It's not bad, though.. But I was expecting peach. Not to forget that this lip tint will stay on your lips for around 5 hours without eating or drinking. A great staying power for me anyway, and this does moisturizes your lips unlike Tony Moly's. I do love this lip tint. I use it daily along with my other lip tints. It gives a nice pink, natural shade to my lips. The staying power is also good. But, for those who look for peach color, well, I think you should try it first on your lips (maybe in the Etude House counter near your place) since it gives me pink shade instead of peach. So, any of you have recommendation of good, affordable, peach lip tint/ stain? cantik banget di bibir, tia! hehehe bikin keliatan seger. Aku punya versi lama nih, bedanya apaan? botolnya aja kah? Ahhh warnanya cantik ya di bibir kamu, di aku biasa-biasa aja. Hi Dear, thanks for leaving a comment on my blog..will try to do more tutorial, but you know, i m not the expert tho..haha.